DVDSleuth.com is your source for daily DVD news and reviews. We have spoken many times over the years about belated sequels -- those story continuations which show up years, even decades, after the series appeared to have concluded. And, as we've seen, most of these movies don't do justice to the films which came before them. But, here's the question; Are audiences really clamoring for these projects? Just because a movie was popular five, ten, fifteen years ago, this doesn't mean that it will have any allure today. This is what makes Super Troopers 2 different. The original 2001 movie became somewhat of a cult film and has done well in home video sales and cable TV airings. In 2015, Broken Lizard, the team behind that film, started an Indiegogo page to get funding for a sequel. Within hours, the initial goal was met and this convinced investors to put up the money for the rest of the budget. So, apparently, this was a money which people wanted. Now that the movie is here, the question becomes, was it worth the wait? Super Troopers 2 continues the adventures of Vermont Highway Patrol troopers Mac (Steve Lemme), Rabbit (Eric Stolhanske), Foster (Paul Soter), Thorny (Jay Chandrasekhar), and Farva (Kevin Heffernan). Unfortunately, as the story opens, they are no longer on the job, as they were involved in a vague incident involving Fred Savage. So, they are now working at other jobs. However, things take a positive turn when it's revealed that part of the Vermont-Canadian border had been incorrectly surveyed and that a small town in Canada is actually part of the United States. The guys, along with their commander, Captain O'Hagan (Brian Cox) are sent to the town to assist with the transition. But, this task immediately becomes a challenge, as they are met with resistance from the locals. Things get even murkier when a mysterious smuggling ring is discovered. Can this wild group save the day? 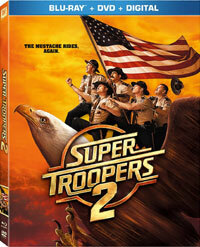 Fans were clearly excited about the film, but the question remained, what would Super Troopers 2 be? I suppose that there was a chance that the film could be something completely new, but, as it turns out, Broken Lizard took the approach of a classic band on a reunion tour. (Despite the fact that the troupe has remained together.) The second film plays like a greatest hits package of moments from the first movie. If you examine the plots of the two movies, they are essentially the same -- We have a group of crude, seemingly under-qualified state troopers who have a run-in with local cops which trying to track down a drug smuggler. This brings up another question -- Was this lazy writing, an attempt to show that law enforcement can be redundant, or a way to welcome viewers back to this world? No matter the reason, it is undeniable that Super Troopers 2 is a lot like its predecessor. However, that nitpicking doesn't change the fact that there are some truly funny moments. I can't say that if you liked the first one that you'll like this one, but the comedy is very similar, if it doesn't feel as fresh. The movie gets off to a somewhat rocky start, but it quickly finds a groove and we get a mixture of physical comedy and crude humor. The personalities of the main characters are the same as before, as everyone gets their moment in the spotlight. There is a great running gag concerning Thorny's fascination with a certain Canadian drug. The jokes concerning the local Mounties who run afoul of the troopers do get a little tiresome after a while. If Office Rod Farva was your favorite part of Super Troopers, then you are in luck. I don't know if Kevin Heffernan is a good actor, but he truly inhabits the role of Farva and he becomes the guy that you love to hate. His "shenanigans" here are truly bizarre and there's a great call-back to the first film involving one of his odd obsessions. It would have been nice to see Broken Lizard try something different with Super Troopers 2, but the resulting film is funny, despite the fact that it lacks originality. Loaded with interesting cameos and guest appearances (no doubt amassed from the number of TV shows which Chandrasekhar has directed), the movie is a good time from beginning-to-end (well, second scene to the end) and will hopefully quell those who have been begging for a sequel. Having said that, there isn't enough Ursula in Super Troopers 2 on Blu-ray Disc courtesy of 20th Century Fox Home Entertainment. The film has been letterboxed at 1.85:1 and the Disc contains an AVC 1080p HD transfer which runs at an average of 37 Mbps. The image is very sharp and clear, showing no overt grain and no defects from the source materials. The colors look very good and the image is never overly dark or bright. The level of detail is very good and the depth works well, as the actors are clearly separate from the backgrounds. The Disc carries a DTS-HD Master Audio 5.1 track which runs at 48 kHz and an average of 4.0 Mbps. The track provides clear dialogue and sound effects. From the opening scene, we are treated to notable surround and subwoofer effects. The action sequences deliver satisfying bass and the rear speakers effects occasionally shine with individual details. The front channels do a nice job of highlighting sounds coming from off-screen. The Super Troopers 2 Blu-ray Disc contains a small assortment of extra features. "(Making) Super Troopers 2" (40 minutes) is an extensive look at the film's production, beginning with the fund-raising campaign which kicked-off the film. From there, the piece moves on-set to give some behind-the-scenes footage and show specific moments being shot. We hear from the cast and co-stars, as well as celebrity supporters. The Disc contains twenty-one EXTENDED/DELETED SCENES which run about 20 minutes. Most of these are quite brief and there are no new characters or subplots here, but there are some funny moments. "Kevin Heffernan: Method Actor" (2 minutes) is a fake behind-the-scene piece which makes it look like he's Farva around the clock. The extras are rounded out by two TRAILERS for the film.